W3C is focusing on technologies to enable Web access anywhere, anytime, using any device. This includes Web access from mobile phones and other mobile devices as well as use of Web technology in consumer electronics, printers, interactive television, and even automobiles. W3C promotes “One Web” that is available on any device. W3C’s Mobile Web Initiative helps ensure the best user experience on mobile devices, taking into account device capabilities, location, and other context information. The W3C Speech Interface Framework is a suite of specifications (e.g. VoiceXML) integrating Web technology and speech interaction. VoiceXML, PLS, SISR, SRGS, SCXML, and CCXML all contribute to the Speech Interface Framework. Devices come in many shapes, capabilities and sizes which define constraints on the content these devices can handle. Device descriptions, content transformation guidelines, device APIs and CC/PP help developers to optimize the user experience. Increasingly, interactions with devices doesn’t only happen with a keyboard, but also through voice, touch and gestures. 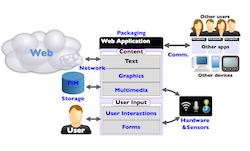 The W3C Multimodal architecture and its components (EMMA, InkML) allow developers to adapt applications to new interaction modes. With the advent of IP-based devices, connected TVs are progressing at a fast pace and traditional TV broadcasting is quickly evolving into a more immersive experience where users can interact with rich applications that are at least partly based on Web technologies. There is strong growth in the deployment of devices that integrate regular Web technologies such as HTML, CSS, and SVG, coupled with various device APIs. Work on payments at W3C was supported in part by the HTML5Apps project, and today, the project’s team is pleased to announce that W3C just launched the Web Payments Working Groupto make payments easier and more secure on the Web. The Web payments Working Group is charteredto develop standards to support a wide array of existing and future payment methods. Standard APIs will allow users to register payment instruments (such as credit cards or payment services) and select the right payment type through the browser, making payments faster, more secure, and easier, particularly on mobile devices. The standards should also make it easier for Web developers to integrate existing and new payment flows into their applications. Last week a new charter for the Web Content Accessibility Guidelines (WCAG) Working Group (WG)was formally approved by W3C after having been reviewed by the W3C Member organizations. For the first time since the finalization of WCAG 2.0 in 2008, this charter allows the Working Group to explore ways to provide guidelines beyond WCAG 2.0. The WCAG 2.0standard continues to be the preeminent reference for web accessibility. A growing number of national and organizational policies around the world reference WCAG 2.0, including Canada, Australia, Japan, India, and the United States. WCAG 2.0 holds up well today despite significant changes in technology. There have been some changes to the technology landscape, however, that were not fully anticipated in the development of WCAG 2.0. Changes in how people access the Web on mobile devices require success criteria that address those situations more specifically. Users with cognitive and learning disabilities and users with low vision have suggested ways in which success criteria could better address their requirements. In recent years the WCAG Working Group formed task forces on mobile , cognitive , and low visionaccessibility to define requirements and candidate success criteria for these three areas. New technologies on the horizon and the rapid evolution of the underlying technologies for user interaction on the Web are likely to continue to drive the need for new guidance. The WCAG charter just approved will serve as bridge to begin work on extensions now while we continue to define what the next generation of WAIguidelines will look like. The Working Group is gathering requirements that may lead to the creation of an updated version of WCAG, or a new set of accessibility guidelines altogether, or both. In order to better integrate the components of web accessibility into a single set of guidelines, the Working Group is exploring the possibility of merging with the Authoring Tool Accessibility Guidelines and User Agent Accessibility Guidelines Working Groups. The Authoring Tool Accessibility Guidelines Working Group (ATAG WG) has just published the completed Authoring Tool Accessibility Guidelines (ATAG) 2.0 ; and the User Agent Accessibility Guidelines Working Group (UAWG) has just published an updated working draft, rolling in comments from browser vendors and others, and will be publishing the User Agent Accessibility Guidelines (UAAG) 2.0as a Working Group Note soon. The HTML5Apps continues its series of interviews of European SMEs. Today, we go to Germany, where the Cocomoreheadquarters are located. The discussion was held with Alejandro Leiva, based in the Cocomore Spanish office in Seville, is the technical lead of mobile and emerging technologies, and with Christian Winter, Head of Frontend Development in Frankfurt, specialized in responsive Web design and the optimization of interactive Web applications for mobile devices. We’ve struggled for a while with storing data — localStorageproved unreliable as the stored data could be wiped out by the OS; but we’ve now switched to Indexed Database which seems to solve that issue well enough for us. The two-year EU-funded HTML5Appsproject proudly looks back to its achievements. The project, ending in September 2015 successfully accelerated the development of standard Web technologies required to make HTML5 apps competitive with native apps, specifically in the areas of Web payments and rich mobile Web APIs. [The full press release is available in the Press sectionof this Web site]. Payments have been identified early on as a major gap, and on March 2014, the HTML5Apps project organized a W3C Workshop on Web payments . It immediately gathered a lot of interest from a wide variety of stakeholders, ranging from banks, merchants, payment service providers, mobile operators, and many others. As a result, a W3C Web Payments Interest Group was formed. Chaired by Bloomberg and NACS representatives, the group is composed of 104 participantswho have been busy at identifying specific standardization opportunities and building consensus on which of these need to be addressed within W3C. After gathering industry use cases and requirements to help ensure that the standards developed have the ability to include business-to-business (B2B) payments as well as financial institution-related payments, the group proposed to standardize APIs – supporting functionality such as payment instrument registration, payment initiation, and payment completion – to enable an automated secure foundation for future Web payments capabilities. As a result, W3C is now in the final stages of starting new standards work to make Web payments both easier and more secure. HTML5Apps conducted a series of interviews with European SMEs to investigate their need for fast and easy development of innovative Web-based services. As a result, there is a need and strong support for in-progress standards around offline access, push notifications and access to device APIs. Where specification efforts had not started yet, the project brought them to the W3C Web & Mobile Interest Groupto report new standardization opportunities. For the past two years, the HTML5Apps team published, on a quarterly basis, a roadmap entitled “ Standards for Web Applications on Mobile ”. Acclaimed by Web developers, this document summarizes the various technologies developed in W3C that increase the capabilities of Web applications, and how they apply more specifically to the mobile context. The latest edition of this roadmap was published in August 2015. It notably includes additions related to emerging work such as the proposed charter for a Web Payments Working Group. The HTML5Apps team continues its series of SMEs interviews across Europe. Today, we go to Spain, and more precisely to Gijón (in Asturias, north of Spain), where is located the startup UbiqWare. UbiqWare is specialized in the development of cross-platform multi-device software solutions, offering products, services, knowledge and experience to other software companies. Hello, can you tell us more about your company and its business at a high level? Adopt agile methodologies that facilitate success in software projects, regardless of their complexity. We propose tools such as the Atlassian suite (JIRA, JIRA Agile, Confluence, etc.) or other free alternatives, such as Redmine. We put a strong focus on continuous integration and continuous delivery/deployment. For this, we use DevHaven, our solution for continuous integration and delivery with a special focus on cross-platform development, with initial support for Apache Cordova projects, and plans for Grails, native iOS, native Android and Web projects soon. What is your experience in developing cross-platform mobile applications? Part of the team is coming from the R&D department of Fundación CTIC. We worked in projects involving development under native and (desktop-only, responsive and mobile-first) Web development. In the early stages of our work in CTIC, Web and native were separated worlds. JavaME, Symbian and Windows Mobile were the most popular technologies used, whereas XHTML-MP and other HTML subsets and flavors were used for mobile Web development. In particular, we worked on MyMobileWeb, an open-source platform for browser detection which delivered the most suitable markup (and rest of resources) formats. We first collaborated with a Spanish startup on a cloud service to provide companies with a unified vision of their digital properties and general business performance by means of the integration of all their business metrics, Web analytics, campaigns and social media data in a single panel. They work with quite a few well-known international companies from a variety of industries.We analysed the code of their Web app and created a much smoother version that was packaged as an Apache Cordova app for iPad, adding offline capabilities. Thanks to their Web development skills, they are creating a universal iOS version and an Android version, both for mobile and tablet devices.We are now starting another project improving the way in which they organize their code and software development methodology, trying to take them to a single codebase that finally generates Web apps and mobile apps. This company is the first user of DevHaven, in its current internal stage. Support for a Web development company in mobile apps creation. They have designed Web sites and applications for public institutions or consulting companies. Following increased requests from customers to create a mobile app in addition to a Web application or site, they chose UbiqWare as their technology provider and advisor to create cross-platform solutions based on responsive Web + Apache Cordova (and the corresponding plugins and extensions). Development of a mobile video surveillance application for a company that provides video surveillance services for large companies. One such company has started to complement their fixed video surveillance system with the use of a mobile application by their security guards. The first version of the application was developed for iPad, under a native development approach. An Android version for tablets is expected to be requested in the next months. This is a case in which performance suggested a native approach, due to the requirement to display several video sources as smoothly as possible while providing a UI with minimum response time. Mobile application to manage the balance associated to NFC bracelets used for digital payments, developed for one of the leaders in Spain in the field of digital payments. It has been developed in Apache Cordova. What do you think about the gap between native and Web apps? When the guys in Nitobi, the original company who created PhoneGap later acquired by Adobe, were asked about the future of PhoneGap, they said the ideal situation would be that PhoneGap would no longer be required. They expected that the path leading to browsers having access to native features would continue, thus making the existence of tools such as PhoneGap (contributed to the Apache Foundation as an open source later named Apache Cordova, which is the foundation to PhoneGap) unnecessary.Unfortunately, the expectations on Device APIs in Web browsers have not been fulfilled and there are many cases in which native development is required. Sometimes, completely using a native approach or by enhancing hybrid technologies with native plugins. In addition, more powerful processors, larger memory chips and faster secondary storage technologies are included in newer devices. This reduces the difference in the perception of performance for human beings, between Web applications and native applications. This is something that has been evolving day after day since the creation of hybrid development approaches. Therefore, the amount of business cases in which hybrid development can compete with native development is increasing. This is the reason why development teams with skills in responsive or mobile-first Web development dare to start with the release of mobile applications via app stores. Which platform you prefer to rely on: native or Web? and why? We rely on Web development, including hybrid development with Apache Cordova. We only go for native if absolutely required, as you have seen in our experience in cross-platform development. How do the requests and needs from your customers affect your choices in this space? From the development point of view, customers with the sufficient technical knowledge to have an opinion about it, they would like that Web technologies allowed potentially any kind of project, as a means to code once and execute in as many platforms as possible and therefore reduce development and maintenance costs.From those requesting our service DevHaven, they find that a service that let them focus on Web development by reducing the attention that they would need to pay to things as compilers, SDKs, etc. is really useful. But in general, our customers want both a responsive Web app and a presence on the app store, for which an hybrid app (sometimes, but not always built upon the responsive Web app) is required. While we believe in the Web as a universal platform, our customers are not quite convinced yet! What are your needs in terms of Web standards? Which Web standard(s) are you waiting for specifically? This would stop us developers from requiring Cordova plugins, although Cordova (or similar solutions) would still be necessary in order to generate the mobile app. and push-messaging plugin to send remote notifications. Thank you for your time! I will note that your town is also the home of the W3C Spanish Office! A deliverable of the HTML5Apps project, the August 2015 editionof the W3C Standards for Web Applications on Mobileis out! This document is the 18th edition of this overview of mobile Web applications technologies. The previous edition was released in May 2015 . A live version of this document accepts contributions on the W3C Web and Mobile Interest Group Github repository. The 9th edition of the State of the Developer Nation Q3 2015 reportis now available for download. It presents the key findings from a survey that the HTML5Apps project helped to promote. I was present at the Edge conferenceon 27 June in London, UK, representing the HTML5Apps project. That conference, organized by FT Labs for the past 5 years, targets discussion and debate of leading-edge use of client-side Web technologies. It aims at being very participative in its nature, and was organized this year around a set of panels in the morning and breakouts in the afternoon. Publishers think that the Web remains a critical part of the traffic they get on mobile, and that the notion of progressive appscoined by Alex Russell matches well with the experience these publishers are facing with native. W3C is aiming to streamline Web Payments with new standards that will provide a uniform way for merchants to integrate payments into the Web with a level playing field for payment service providers and value added services. The HTML5Apps project initiated this work in 2014 by organizing the Web Payments Workshopat the “Bourse de Paris” to discuss requirements related to usability, security, mobile payments, digital wallets, ubiquitous payments, the Internet of Things, and more. The Web Payment Interest Group , formed as a outcome of that workshop, is meeting this week in New York, in the heart of the financial community, for a three day meeting (June 16-18) which aims to prepare the ground for launching a W3C Working Group on Web Payments standards later this year. The HTML5Apps project is helping stakeholders to clarify the scope and technical direction for chartering the new group.